A wonderful installment to a great series, The Bloody Valkyrie is, perhaps, the best release seen in English thus far. (I believe they are up to Vol. 11 in Japan). We pick up the story with Shalltear who is traveling with Sebas and Solution Epsilon, one of the maids from Nazarick, as they traverse the countryside on Ainz’s orders looking for helpful information. Now, as the last few lines in volume two stated, Shalltear betrays Ainz and Nazarick, going rogue. It’s up to Ainz to stop her one way or another. Unfortunately, this won’t be easy. Shalltear is one of the most powerful floor guardians in Nazarick and, perhaps, second in power only to Ainz himself. Complicating things even further, Ainz’s magical abilities and Shalltear’s are of opposing types, leaving Ainz vulnerable to her attacks. The book moves along pretty quickly. Action abounds with plenty of fight scenes. The plot is set at a good pace, both more consistent and faster overall than the previous two titles in the series. At no point did the book feel as if it were dragging. The slower sections focused largely on Ainz contemplating how things have or might be changed in this world as opposed to Yggdrasil are much fewer in number. When present at all, they tend to be shorter. This is partially due to the fact that most of the basic, vital information needed for world building and characterization were imparted with the last two novels, leaving more room for magic, mayhem, and the undead hordes in this one. I found myself caring much more about the introspective scenes there were this time around too. The stakes are higher and more personal here. For the first time I felt like Ainz was truly threatened. He isn’t simply looking for information, followers, or playing adventurer in this book, some common themes from the previous two. Overall, the tone is more serious in this book. That isn’t to say the comedy is gone. There are plenty of scenes, especially between the floor guardians, that are very humorous. I did feel that some characters were slightly less over the top. Some of these humorous scenes also played more on the macabre, such as Shalltear asking Solution how exactly she manages to absorb humans and digest them while still alive and we get the answers in fairly gruesome detail. The Interlude, the section near the middle of the book which usually features some lighthearted scenes between the floor guardians in Nazarick is used much differently here. This time we follow Gazef Stronoff as he reports to the king on the events way back in book one. The scene is short, but tense, with plot and important details potentially set for future books instead of the humor and character development we’ve seen previously. Speaking of things different from what we’ve previously seen, if you’ve watched the anime things are ever so slightly different in the original novel version. While nothing major is changed plot wise, we do get to meet Nigredo, one Albedo’s two sisters. She is a rather terrifying character, which is really saying a lot considering most of the main and supporting characters are the undead, monsters, and similar fare. And I really hope we see more of her in future novels. Important themes are delved into more deeply than the previous novels within the series. Ainz, along with some of the NPCs themselves, question the extent to which their programming, stats, pre-written backgrounds, and subtle influence of their creators drives their actions and motivations versus how much is their own will. The floor guardians have very different opinions on Ainz’s decision to face Shalltear alone. Albedo gives quiet support and understanding while Demiurge is of half a mind to disobey all orders and go after Ainz just in case something happens to him. Ainz also questions himself in this novel. Not the hypothetical questions we’ve seen before – how to be the best ruler, how to keep his minions happy and in line. He is almost hyper aware of his flaws since the end of volume two, where he feels he could have saved everyone and avoided the entire fight if he’d only done things differently. This is a very human reaction, and, in fact, Ainz does refer to himself by his original name Japanese name, which we haven’t seen since book one. He acts very human in this book, emotions so high that they begin to override the normal emotion dampening settings all undead have. More importantly we see him begin to change. There are very few times he refers to the rest of the cast as NPCs, something he did a great deal in previous books. They are called floor guardians most of the time, and his “children” a few times as well. Ainz cares. More than maybe he realizes for the majority of the book. Also of note is just how differently Shalltear and Ainz treat their subordinates, whether they are direct subordinates or the simple undead minion hordes their magical abilities can produce. On a fun note, we get to see Ainz battle not as Momon the Adventurer, holding back as he fights with or against humans from whom he is hiding his true identity. 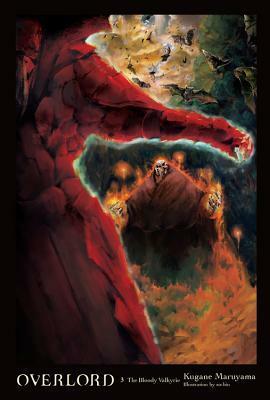 We see him fight as Ainz Ooal Gown, leader of the tomb of Nazarick. And boy is it worth the wait! Overlord, Vol. 3: The Bloody Valkyrie is an amazing addition to the Overlord series. I really loved this novel, ultimately scoring it higher than volumes one and two. If you enjoyed the previous books or watched the anime, you will love this one as well. If you like gorgeous, full color art in your novels, pick this up. Stay tuned for the next release in the series which, according to the publisher’s website, seems to be gearing up for a release this May.